I have a tendency to root for the underdog. I rooted for the Phillies throughout the 90s, when my heroes Lenny Dykstra and Darren Dalton could rarely lead them to a win. It’s a mixture of a desire for upheaval, that the unexpected can happen, as well as pure sympathy for the ones who always lose. Do you know who always loses in science? Dirt. No one cares about it. I mean, it’s a mixture of poop and rotting plants and animals. It harbors fungus and worms and bacteria. And while it is generally accepted that it has an important role to play, it tends to be overlooked because it’s just not all that exciting on the surface. Why study ground up brown stuff when you can study WHALES or CANCER? That’s why I love it when dirt wins, as it does in this early-access article from PNAS entitled “The impact of soil microorganisms on the global budget of δ18O in atmospheric CO2” (doi:10.1073/pnas.0905210106). The closest I’ve heard soil come to being included in the climate debate is the possibility of pumping liquid carbon dioxide deep beneath the earth’s surface to sequester it: not the most dignified of positions. But this article provides evidence that it is more involved than that, and helps to mollify some discrepancies between prior models and observed measurements in carbon dioxide. One of the most common ways to trace the origins of oxygen in the atmosphere is through isotope analysis. Carbon dioxide cannot dissolve in water on its own, but needs to be made into the ions HCO3+ and H+ so that it can be transported in fluids. 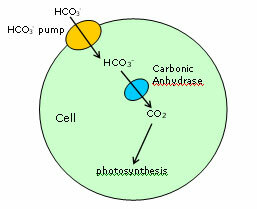 An enzyme, carbonic anhydrase (CA), switches carbon dioxide between its dissoluble and soluble forms, and is found in both plants and animals. It is an incredibly important enzyme for both respiration and photosynthesis. If CO2 were ionizing on its own, without an enzyme, it would take far longer, and the systems would be far less efficient. However, it leaves a mark: a heavy isotope of oxygen. The new CO2 molecule, built by CA, adds 2 more neutrons to oxygen, creating a δ18O isotope which we can trace, thus tracing the activity of CA. Since δ18O is a heavy isotope compared to oxygen-16, the normal form, it preferentially remains in leaf tissues during transpiration and evaporation. Eventually these leaves die and fall to the soil, where they are broken down. The amount of δ18O in the soil has traditionally been used as a measurement of plant photosynthesis. The possibility of CA activity in soil has been disregarded bcause of the high levels of δ18O in just the top few centimeters of soil, indicating that it is due just from decomposing leaves. The 18 authors of this paper decided that this assumption wasn’t good enough. What if microorganisms are creating δ18O in the soil due to their own CA activity? What would this mean for the overall oxygen budget? First of all, it would mean that plant photosynthesis would have a lesser role. It could also change the estimations of photosynthesis vs. respiration in our atmosphere, since the microbes could be either photosynthetic algae or cyanobacteria, or respiratory little buggers. The authors took the measurements of δ18O at different soil depths from 7 different major earth ecosystems from the field, and also created the artificial conditions in chambers with to determine if δ18O levels differed between the two. They also used this “chamber-flux” data to estimate different rates of δ18O creation under different CA catalyzation levels. These data showed that naturally measured δ18O levels were greater than the control levels without CA: up to 300x in the more productive ecosystems! This provided clear evidence that δ18O is being created by soil microorganisms through CA enzymatic activity on their own. This information was consistent with previously observed and modelled δ18O curves, shown in the figure above. The top half shows the observed δ18O levels in dark blue dots, with the modelled line in black, with the frames increasing in CA activity from left to right. In the right frame, with CA activity at 300x the left frame, the modeled and observed δ18O creation rates overlap. (The curve is based on latitude — northern latitudes, with much vegetation and high photosynthesis on the left, decreasing in photosynthetic production as we move southwards.) This provides more evidence that CA is present in soils, as in an ideal world, observations and models will match up. The bottom half of the figure is based on the concept of isoflux. This is a measurement of CO2 in the atmosphere, with positive values indicating photosynthesis, while negative values indicate greater respiration, which removes CO2. The “soil invasion” line, in orange, goes from showing no-change in the no-catalyzation scenario, to absorbing nearly as much CO2 as respiration. So, really, what is this paper saying? First of all, don’t ignore the dirt! Soil microbes may be small, but they are vast in number and can really have an impact on our element cycling. More than anything, this paper helps to adjust previous models. 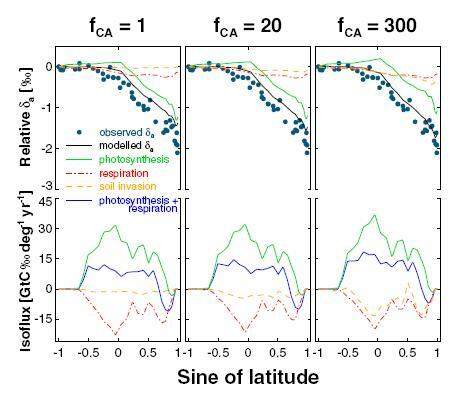 It suggests that the soil may be more of a carbon dioxide sink that we previously thought, because we now have evidence that respiration is taking place due to this increase in δ18O from CA use. To me, what this paper really shows is how little we know. We’re trying to model oxygen and carbon in the atmosphere and earth, and there’s so little way of knowing. If it weren’t for this enzyme, carbonic anhydrase, that happens to incorporate a heavy oxygen isotope, where would we be? Modelling is important, don’t get me wrong. But it is also incredibly frustrating because we really don’t know enough to create very accurate models. This paper is a little slice, sure; but we could be missing huge impacts just because they are untraceable.